August 2015 – What's in That Yard? What was Bird Species #31? 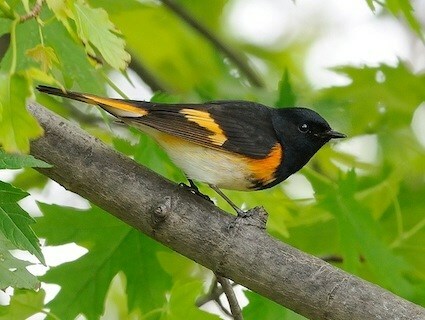 It was a female American Redstart. Perhaps a colorful male will soon appear in That Yard! Deadheading is the practice of cutting spent flowers off a plant. This is often done to encourage the plant to bloom again. The reason the plant blooms again is because its life cycle was interrupted. A flower ‘dies’ after it has been pollinated; the plant then sheds the parts that are involved in pollination and puts its energy into forming a seed. Cutting off the flower at this stage destroys the seed – in effect, it causes the plant to miscarry. Successful completion of seed formation is, of course, necessary for the next generation of plants to be produced. Seeds are also a critical food source for birds and other animals over the winter. Some people find seedheads and baby plants to be unsightly, and want their garden to have a longer blooming season without the ‘mess’. Understanding that flowers are just one stage of a plant’s life cycle, and that blossomdrop and seedheads are important stages too, can help us see the beauty in a garden that changes over the course of a year. Many plants can’t survive in the deep shade of the forest floor. Spring ephemerals are a group of plants that have evolved a way of doing just that. Spring ephemerals bloom almost as soon as the snow melts, while the trees above them are still dormant. After flowering, the plants continue to hold their leaves open to take advantage of the short season of sunlight. The energy they produce through photosynthesis is stored in an underground structure. Just a few weeks later, when the trees leaf out and block smaller plants’ access to sunlight, the spring ephemerals return to dormancy. Dying back to the ground, they wait all summer, fall, and winter before coming up again the following year. Within a natural yard, spring ephemerals are a great choice for bringing early-season color to a shady spot. Why don’t pine trees lose their leaves? They do. They just don’t do it all at once. The leaves of deciduous plants (it’s not just trees that are divided into deciduous and evergreen varieties) are intended to last for one summer. They are all shed at once in the fall, and a new set grows the next spring. By contrast, the leaves of evergreen plants are intended to last for two or more summers. These growth cycles are staggered, so that in any given fall, a plant might be shedding a quarter or a third of its leaves, while keeping the rest. Because the majority of the leaves stay alive and on the plant, the plant is “ever green”. An evergreen is not the same as a conifer. “Coniferous” literally means “cone-bearing”. While some evergreen plants bear cones, others use different structures for dispersing their seeds. Evergreens help bring life and color to long Wisconsin winters. Because they often have dense growth, birds use them as shelter against the cold. 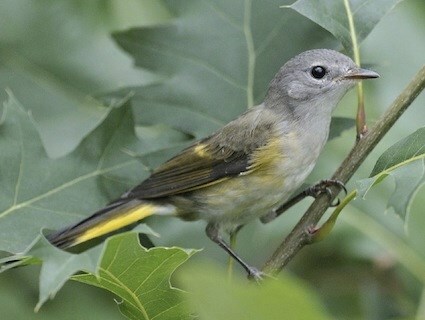 They also provide food and nesting sites, and are often low-maintenance, making them a great addition to a natural yard. What does ‘dying back’ mean? Unlike animals, plants have a decentralized body plan. This means they can lose any part of themselves – even quite a lot of themselves – and be just fine. We’re familiar with this phenomenon through the annual event of leaves changing color and then falling. In preparation for the short, cold days of winter, many plants let go of their food-producing parts and enter a dormant phase. Some plants go further, letting go of all their above-ground structures and spending the winter as a mass of roots. This is known as ‘dying back’, and it is normal and healthy. So long as the roots remain protected from harsh winter conditions, the plant will pop up again in the spring. Some people consider plants that have died back to be unsightly, but they are an important part of the winter landscape, providing food and shelter for animals. Anything that doesn’t get eaten can be cut down in the spring, to make way for new growth. The harvested material can be composted, recapturing its energy to be used by future plants. What other landscaping choices are legal in Madison? Madison city ordinances seek to prevent neglect of homes and yards. So long as a property is being appropriately taken care of, however, a wide variety of landscaping choices are legal. -Conventional lawns of short grass are legal and are still common in the city. In some parts of the United States, lawns are not legal, mostly due to the unsustainable amount of water they require in areas prone to drought conditions. -Tall grass is legal, so long as the property owner follows the process to notify the city that they have a natural yard. -Garden beds containing flowers or vegetables are legal. -It’s legal to have a yard containing many trees, with leaf litter covering the ground underneath them. Wooded lots are generally considered to be one of the most valuable types of real estate. -It’s legal to fill a yard with hundreds of pink plastic flamingoes, which are the official city bird. –Large metal sculptures are also a legal addition to a Madison yard. Most if not all of these choices are in actual use in Madison, bringing a wonderful diversity to our city. What is the natural life cycle of grass? As anyone who has mowed their lawn dozens of times in a season knows, grass does not stay short. However, it also does not grow infinitely. Each species of grass wants to mature to a particular height before moving on to the next stage of its life cycle. Bamboo, which is technically a type of grass, can rapidly grow to over 100 feet tall. The tallest grass species in North America, a reed called phragmites, grows in marshes and can reach a height of 13 feet. The grass species found in lawns are much less ambitious, stopping their growth at a height of about 2 feet. Once these species have reached their mature size, they begin the reproductive stage of their life by forming flowers. Because grasses are pollinated by wind rather than by insects or birds, their flowers are small and inconspicuous. Next, pollinated flowers mature into seeds. In grasses that are grown as commercial crops, such as wheat and corn, the part of the plant that is harvested forms at this stage. If left alone, the seeds will disperse and, if they’re lucky, grow into new grass plants. The cycle of life continues. When grass is regularly mowed, it is kept perpetually immature and unable to reproduce through flowers and seeds. However, it can still reproduce! Just as a mown grass plant quickly grows back its lost part – the blade – grass clippings will try to regrow their own lost parts. If left lying in a favorable location, clippings will form new roots and become independent plants. The great diversity of the grass family means that it’s possible to put away the lawnmower forever and still have a short lawn. Some species, such as dwarf mondo grass, look similar to traditional lawn grasses but never get more than a few inches tall. Other species, like Pennsylvania sedge and the fine fescues, grow a little taller but flop over into soft mounds. These grasses are great alternatives for homeowners who are interested in mowing less but are not yet ready to abandon the aesthetic of a lawn.